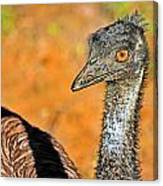 Great close-up of an ostrich - what piercing eyes! I love this. Quite the personality. Thank you for featuring my work in The Broadcast Monkey ! If you are a girl....you have to love this! Great image, definitely looks like she attitude! Love how her eye matches the background colours! Well I was glad there was fence between me and her, otherwise I would bea little nervous :) The male is black with white wing tips and tail plumes. 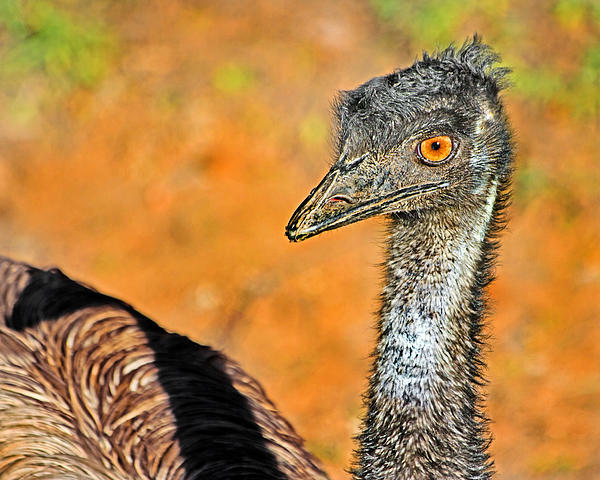 The female has light brown and gray plumage and is slightly smaller than the male. When in season, the males will have bright red beaks, shins and sometimes neck. The hens will turn a silvery gray when in season. Ostrich is the largest bird in the world and they only have 2 toes. 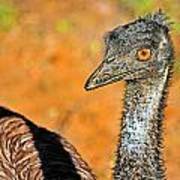 Contrary to popular belief, ostriches do not bury their heads in the sand: the myth probably originates from the bird's defensive behaviour of lying low at the approach of trouble and pressing their long necks to the ground in an attempt to become less visible. Their plumage blends well with sandy soil and, from a distance, gives the appearance that they have buried their heads in the sand. They also dig for stones to eat and they can stick there head in the ground to find the perfect once.